Innovative, compact and performing, the Atmos Transporter is one of the smallest dry herb vaporizer pens in the world. It is the proof that small vaporizers can have advanced technology features, offer high-quality performances while being pocket-sized. Read our review and find out about this impressive device. The vaporizer comes in a small dark box, solid and compact enough. We liked the Atmos design, very classy and it gives a feeling of what is in the box. The Atmos Transporter is an advanced dry herb vaporizer that looks more like a flask. It looks like you are taking a sip while you are in fact drawing. Unusually cool. However, in a way, it might also look like you are a drinking alcohol. We also liked that the Transporter does not really look like a vaporizer, more like a hip-flask, so it stays compact and is easy to carry around, in pockets or bags (and we tried!). Adding that the model is light enough, hand-sized, easy to grip and fits smoothly in the palm. The unique button setting makes it an easy device to use. On top of this, it heats up fairly quickly and does not require much maintenance. The Transporter features a chamber with an embedded heating part, a term specific to Atmos. In other words, it means that there are no heating coils exposed as there could be in other conduction vaporizers. Also, the device chamber is a bit like a convection oven and gets hot sufficiently to cause the dry herb to produce vapor in direct contact. The vapor remains smooth and pure. The chamber can hold large bowls of material. Also, if using a grinder, which is recommended, it can get two bowls worth inside the chamber. The Transporter features only one heating option. Advanced users might not be satisfied and would expect more flexibility, however, this would be perfect for beginners or people looking for an easy device. The set temperature is pretty decent, even a little too high with a risk of getting dark brown smoke. Somewhere between 370°F and 390°F, it is still designed to prevent dry herbs from burning. The device features rechargeable 2600mAh batteries. Fully charged, we could use it for two days. Quite average but slightly longer than other vaporizers in similar categories. First of all, we needed to load the Atmos Transporter until it got – at least – almost full. We found the vaporizer easy to fill in. We swung open the bottom part to reveal the heating chamber. Then we used the supplied packing tool and pressed our herbs in. We placed around .1-.2g. This is important to do so; otherwise, the amount of vapor might not be satisfactory. By the way, we chose dried lavender flavor and ground the herb thinly, to have a maximum flavor! So after we loaded the herbs, and screwed the chamber back, we pressed the power button 5 times quickly to turn the device on. We held it for about 5 seconds to begin the start process, and once the power button turned green, it was ready to use. The device only features a unique temperature setting. It felt like the right temperature, however, at random times, the vapor felt too hot or a bit harsh. We even got some dark brown vapor once. The vapor quality was ok, the taste too. We could feel the lavender flavor pretty well in our first 7 draws, out of the 10-15 draws the device gave us in one session. It was not bad at all. Mid-session, we decided to stop and try stirring the herbs, and we got excellent results with a smoother vapor and flavor! Also, we liked the fact that the device kept the odor to a minimum. Moreover, when we screwed the cap, we were getting nice and visible vapor clouds, which dissipated quite fast. We experienced that it can be a bit difficult to clean when it is clogged by residues. Other than that cleaning was easy enough and quick, as much as loading and heating up the Transporter. Simply unscrew the bottom part and use the supplied cleaning brush to clean the chamber. We advise brushing off all the Transporter parts after every use. This is the best way to keep the vaporizer highly performing. Both manufactured by Atmos, the Transporter, and the R2 are small dry herbs vaporizers. The main difference is obviously the shape, and the R2 is a pen-shaped device. However, it also features significantly different features: the anodized heating chamber, mesh and ceramic filters and glass screen. The R2 has a dual function technology for herbs, wax, and even waxy oils. The chamber’s anodized heating part makes it possible and offers a wider flexibility and better flavors than the Transporter. It makes a sign to be able to get great flavors and vapor quality. Other than that, both devices share many similar features and come both very handy, light and easy to use, with their single button, 5 seconds heat up, battery strength and overall quality performance. So we conclude that we like both! Overall, we had a positive feeling about the Atmos Transporter. It is great with dry herbs and gets the best flavors out of them. Moreover, the ceramic chamber ensures a smooth vapor with no combustion.We love unusual things, and the shape of the Atmos Transporter is one of them. Designed for discretion, it is small, lightweight, portable and discreet. Also, it has a funny flask-like appearance. 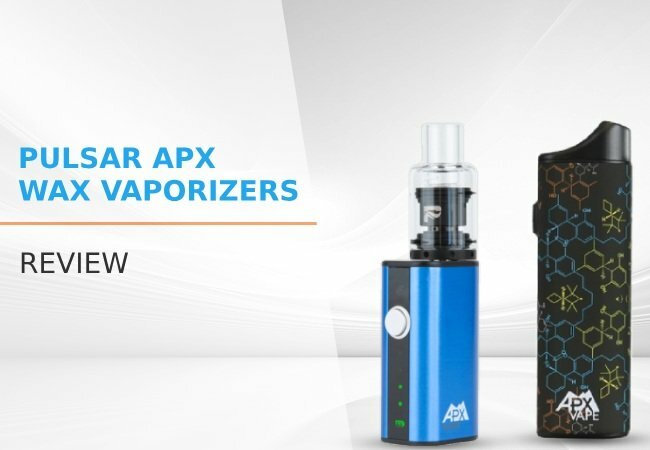 The Pulsar APX is a versatile vaporizer which gives users the ability to vape wax concentrates and dry herbs. APX V2 is an updated version of APX.